ADI will be at Booth #3254 Moscone West, serving espressos, and will have a live hands-on Oracle Planning and Budgeting Cloud Service (PBCS) application for users to interact with. Come learn about all tour deployment options from Oracle PBCS to server hosting and managed services. Stop by my session at this year’s Oracle Open World…. Eric Helmer, VP of Global IT Services at ADI Strategies and an Oracle ACE Director, will be presenting CON4996, Session Title: “SaaS? Cloud? Oracle Exalytics? On-Premise? Exploring Oracle EPM Deployment Options” on Monday September 29, from 2:45 – 3:30 PM at Moscone West – 3010. 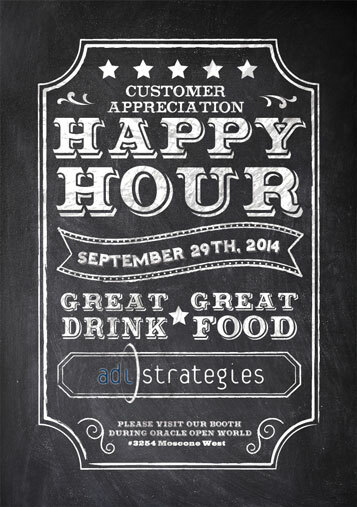 Also – be sure to stop by ADI’s special VIP event Monday September 29, 2014, from 6:30 PM to 9:30 PM. Please let me know if you are interested in attending! ~ by Eric Helmer on September 3, 2014.